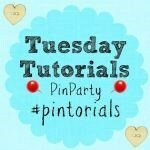 A huge welcome to Week 26 of the Tuesday Tutorials Pintorials Pin Party! It’s the second week of the summer holidays! Have you been following my Summer Activities to check out what we have done so far? If not, do have a peek! This week I am featuring something to do with the word frozen! You Clever Monkey have been using pegs to make a set of Frozen characters! They look brilliant! It will probably save me lot of money if I could make that for my daughter. She is a big fan of Frozen and usually wants me to get her Frozen merchandise whenever we see it in the high street. The next two crafts are from Mini Monets and Mommies. She made two frozen science projects. The first one is the glow in the dark ice paint followed by using ice to paint! Both are so easy to make and fun too! Don’t forget to pop by to take a look at Kate (Birthday ideas), Anna (Book activities) and Hodge’s (B craft) blogs to see who is featured this week. Link up your post– it can be a tutorial, how-to or even food recipe – old or new!